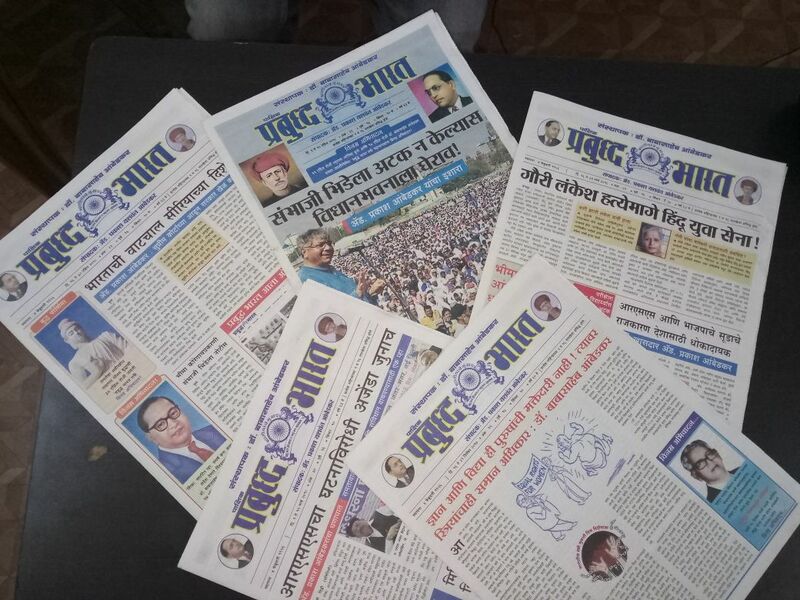 In six months, the Marathi fortnightly has notched up a circulation of 28,000 in Maharashtra. On April 14, it launched its website. In June last year, when Jitratn Patait completed his post-graduation in journalism from Pune University, he knew he did not want to spend his time working in the established, mainstream media but find a space that would help “amplify the voice of the oppressed”. Just around then, in a small office at Pune’s Shaniwarwada, a bunch of Ambedkarites (followers of Babasaheb Ambedkar’s ideas) were already in the process of reviving his legacy by restarting Prabuddh Bharat, the newspaper that he ran until his death in 1956. Twenty-five-year-old Patait instantly knew this was where he wanted to work – he jumped into it when offered a job–he became the newspaper’s sole reporter and also the copy editor. The fortnightly newspaper, six months since it was relaunched, has already grown impressively and now sells over 28,000 copies every fortnight across Maharashtra. Riding on the newspaper’s success, on April 14, Ambedkar’s 127th birth anniversary, the team launched its website too. Ambedkar had considered the press as a key tool in his quest to achieve social justice. With his over four-decade-long journey as a social reformer and a political thinker, he had started several newspapers. These newspapers propagated his revolutionary ideas and focussed on the issues faced by the oppressed and were run at a time when the nationalist movement was rife. His writings remained highly critical of both the prevalent caste system and the nationalist movement which, he felt, remained blind towards the issues of the servile classes – the shudras and the untouchables. In the 1920s, Ambedkar began a newspaper called Mook Nayak (the leader of the voiceless), followed by Bahiskrit Bharat (the excluded India), Samata (equality), Janata (people) and finally Prabuddh Bharat (Enlightened India), which was launched on February 4, 1956. As he moved towards Buddhism, he decided to change the name of Janata to Prabuddh Bharat, aligning with his vision of moving “towards an enlightened India”. But his untimely death on December 6, 1956, and the financial crunch faced by the publication made it difficult to keep it functioning. His son Yashwant tried to keep the newspaper afloat till 1960, but eventually, it shut down. Attempts were again made to revive the newspaper in the 1980s and 1990, but each time it could not be sustained beyond a few months. Last year, a small team of anti-caste crusaders lead by Yashwant’s son Prakash, who is also the leader of the Bharip Bahujan Mahasangh, started a 16-page fortnightly version in Marathi. This new venture is an attempt to fill the gaps in coverage of the established, mainstream media houses. “The Bahujan community finds no representation in the mainstream. Their voices are nowhere to be heard. 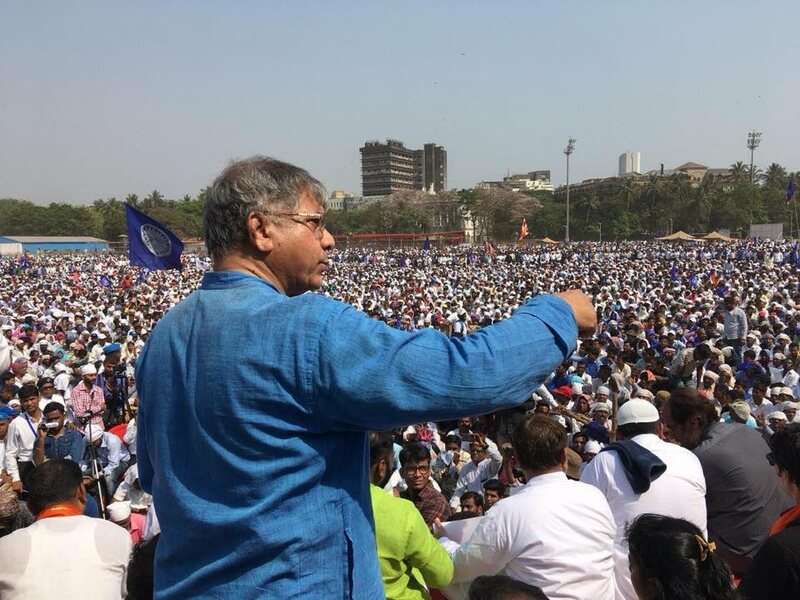 And in the present time, when atrocities and discrimination against the oppressed are at an all-time high, we knew we needed to create our own spaces,” said Sujat Ambedkar, Prakash Ambedkar’s son. Twenty-three-year-old Sujat, a journalism graduate, was working with an English daily in Pune until recently. He quit work full-time with the Prabuddh Bharat team. The other team members include Dalit Panther’s co-founder J.V Pawar as the advisory member of the newspaper, Raosaheb Kasbe, a leading scholar on Ambedkar, Anjali Maydeo, a lecturer at Pune University and Professor Pratima Pardeshi. “Several others are volunteering with us,” Patait said. In the past decade, several significant online anti-caste web portals and blogs have been set up, and have head-on countered the mainstream Brahminical discourse and provided an alternative platform to the Bahujan class. “There is a reason why spaces like Roundtable India, Velivada, Dalit Camera, and several other web portals were formed. They tell you exactly what is lacking in the established mainstream,” Sujat told The Wire. He said Prabuddh Bharat would be an open space and would invite everyone who believes in constitutional values to contribute. The bilingual website along with contributions from different writers, will also upload the writings and speeches of Ambedkar creating a repository of sorts. For now, the newspaper is running on crowdfunding and several people have shown interest in wanting to support the newspaper, Sujat said. Among all other newspapers, Prabuddh Bharat was the only one which could not be archived. On June 2016, a demolition drive at the Ambedkar Bhawan in Dadar in Mumbai led to the almost total destruction of the Buddha Bhushan printing press. The incident had generated tremendous controversy at the time since it meant that all archival material was lost. The demolition was carried out by the People’s Improvement Trust, which runs the Ambedkar Bhavan, after it claimed it was served a notice by the Municipal Corporation of Greater Mumbai which had declared the building dilapidated and in a dangerous condition. The claim was refuted by Ambedkar’s grandsons Prakash and Anandraj and an FIR was lodged against the trust’s advisor, former IAS officer Ratnakar Gaikwad, for his alleged role in the demolition. The municipal corporation too had set up an inquiry against Gaikwad. Most of Ambedkar’s writings, pamphlets, editions of newspapers were lost in that demolition. While his older newspapers were already in the process of being archived, most of Prabudha Bharat prints were lost. “In the process of restarting our work, we stumbled upon some hard-bound copies of the newspaper. But it was bound in such a way that the edges of the paper were pruned slicing the dates off. We haven’t been able to figure out which edition was printed when,” Sujat adds. They are now hoping to reach out to some old activists from the movement who might have worked with Ambedkar and might still have a few copies with them. For the moment, it is a fresh start, to keep the name – and the legacy – of Babasaheb Ambedkar alive.